Another date night and another date night outfit. With a slightly warmer evening, I opted for the Tory Burch sandals and a fresh cream ensemble, incorporating my pride and joy Burberry trench and white jeans from Missguided. It feels like some time since I featured Missguided, yet they really do have some of the best, trend-led collections, so perhaps I need to go shopping there again soon. But the striped turtle neck is also a Missguided find whilst the Navy tote is another new love from Strathberry of Scotland. I’m sure you realise by now how much I love Strathberry. I mean, I have four of their bags now, in a variety of colours, but in honesty, this has to be my favourite. The shape and size is perfect for an everyday bag, fitting in everything I could hope for and closing in such an unusual fastening. I adore the way the handle bar clasps over the opposite handle to close; it looks like it should cost 10 times the price. 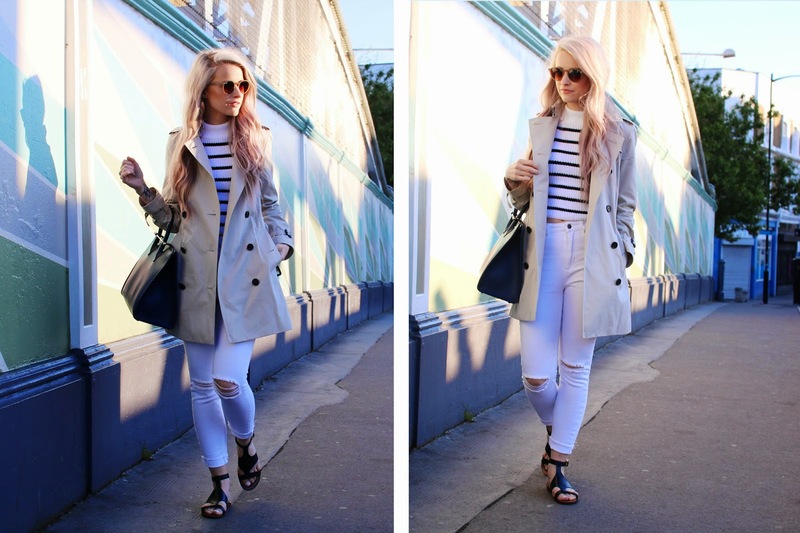 And to save even more, you can get 10% off their bags with my code Inthefrow10! Venturing into the restaurant, it really wasn’t what I expected. In fact I had no idea what to expect, as there didn’t seem to be any images online that gave the game away. So we walked into the restaurant without a real idea of menu, dress code or restaurant type. Luckily, we dressed in something fairly smart casual and it was just right for the aesthetics. Almost like a cool gentlemans games room, with exposed brickwork, large marble tables, scantily clad models in classic black picture frames and large leather arm chairs. We nestled into said chairs and perused the menu of incredible meats and bistro items, both opting for a fish starter and a meat main meal. I chose the crab trifle, with avocado and rye toast, and as someone who has never tried crab in this style before, it was absolutely delicious! The mixture of a tomato sauce with the crab and avocado was actually a taste sensation, and I only hoped for more at the bottom of the glass. Alex went for one of the specials of the day, choosing the grilled squid with a bean salad and lemon to the side. We both devoured the starters in a matter of minutes and awaited Alex’s whole rotisserie chicken and my Lamb main meal, again off of the specials menu. 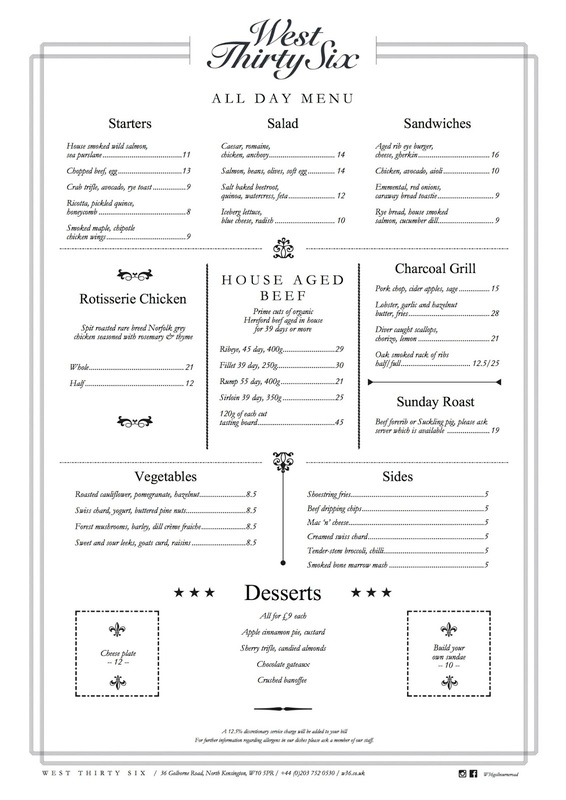 The rest of the West Thirty Six menu is below though, as I literally could not find it on any other website. Needless to say, the main course was just as delicious as the starter. We also tucked into big, fat homemade chips, roasted cauliflower with hazelnuts and pomegranate which was as gorgeous as it sounds, and tender stem brocolli. Somehow, Alex managed to eat all of his whole chicken, growing boy and all that. And as a slightly smaller dish, the lamb was a tender cut with a beautiful bean salad. And we finished with Chocolate Gateaux and Crushed Banoffee, as we never skip dessert. I am the biggest chocolate fiend, so the dark chocolate gateaux had to happen, and my goodness I’m glad it did. With a side of dark cherry sauce and layers of gooey chocolate inside, the cake was to die for. Probably one of the best chocolate cakes I have eaten in a while. We left with very full bellies and large smiles on our faces. We had such a brilliant date night and evening at West Thirty Six. The service was fantastic, the surroundings were cool and alternative and the food hit the mark. This is somewhere we will absolutely be revisiting and is high on our list of places to take friends very soon. I think you’ll have a fantastic time if you visit! Have you ever been, or are you thinking of planning a visit? Let me know!